"We have followed the British tradition and created FryeÂ’s Leap IPA which is one of the hoppiest beers in Maine at 55 IBUÂ’s. Brewed with American 2-row, caramel 20L & 60L Highly hopped with Cascade, Centennial and Nugget and aggressively dry hopped with a mixture of Centennial and Cascade. 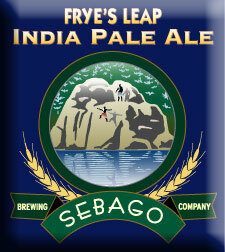 FryeÂ’s Leap IPA is an American-style India Pale Ale. It has a strong hop flavor and a medium body. FryeÂ’s Leap IPA is light golden in color with a fruity hoppiness that comes from extra dry hop conditioning. The IPA is perfect on a summer day it pairs well with spicy foods, vinaigrettes and grilled vegetables. It also is great with oysters, clams and chilled soups." -- Sebago Brewing Co.
First note, massive CO2 explosion upon popping the cap on this one. Massive frothy head pours on the initial pour, and we're having to wait a while for it to settle down. The bottle has a root beer aroma. Pours a medium yellow color with a very active body. Excellent lacing. Aroma is predominantly yeasty with doughy notes. Mild hop presence. Malt presence in the form of a root beer scent. Initial taste is moderately sweet with heavy carbonation, and the taste slowly moves to a moderately bitter taste with a long duration. Light on the mouth, it initially has a watery texture, but we're left dry as it moves on through our palate. Pours a light golden color with a white, small, fizzy head with a light ring of lacing. Unlike the first review, we had a much more subtle open with just a small escape of CO2. Aroma is well-balanced, with a nose of both bread malts, like white bread spread with butter, and gentle hop notes of peach. Initial taste is lightly sprinkled with malts, as the white bread aroma carries into the taste with buttery flavor. The finish cranks up the bitterness, and leaves us with a lip-smacking dryness with a long duration. Light to medium bodied, it has soft carbonation and has a dry texture that lasts and lasts. Re-reviewed on April 9th, 2007.